The linden trees may still be budding, but the hillside will be golden with a host of 60,000 daffodils. They will blow in the spring breeze by the water channel down the Blue Steps. They will crowd near the round moon gate in the Chinese garden and around the poles on the terrace painted as bright as Venetian gondolas. The historic gardens at Naumkeag in Stockbridge have made a name around the world. And in April they will fill with tulips and spring bulbs for the property’s first Daffodil Festival, general manager Brian Cruey said by phone last month from St. Louis, where he paused at a haunted house and Christmas light show convention to look ahead to spring. He has been looking ahead since October. Cruey and a few willing hands planted the bulbs last fall in two weeks of rain. He was setting up for the annual Halloween pumpkin walk and haunted house, he said, and preparing for Naumkeag’s first holiday light show. In November and December, he turned on 100,000 new bulbs -- holiday lights -- and 22,000 visitors came to see them. The 44-room house looks out over the Housatonic River valley on a hillside so steep that the garden is built of stairs and terraces. It is now a historic property maintained by the Trustees of Reservations. Cruey oversees the operations at Naumkeag and seven other properties in the southern Berkshires for the statewide nonprofit land trust. 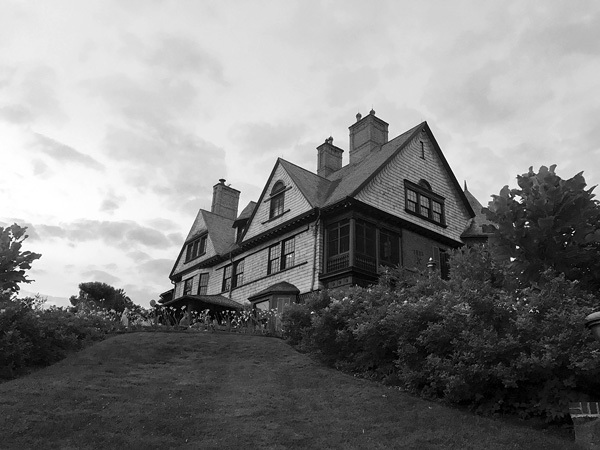 Naumkeag was built as a Berkshire “cottage,” a summer playground for a New York family in the Gilded Age. Joseph and Caroline Choate bought the land and began the house in 1885. He was a lawyer who argued cases before the U.S. Supreme Court; she was an artist and an activist for women’s education – and a co-founder of Barnard College. They created this place as a summer retreat, with its lawns and flowerbeds, and they had a working farm in the valley. When they got off the train in Stockbridge, Joseph Choate would walk down to collect eggs, ask after new calves and scratch the pigs along their backs. In the 1920s, the Choates’ daughter, Mabel, met Fletcher Steele, a pioneer in modern landscape design and a Williams College alum. Over the next 30 years, according to landscape historian Jacqueline Connell, they worked together to transform the Naumkeag gardens. Paths swirled around the winter-hardy roses, and the cocoa shells mulching the beds used to smell like hot chocolate on rainy days. Naumkeag has always drawn summer visitors. But Cruey wants to meet his neighbors and welcome them in. The spring display of daffodils, like the holiday light show, is part of a thoughtful effort to expand Naumkeag’s season, he said, and offer something for the community at a time when plenty of people are looking for things to do. Cruey began this effort four years ago with Halloween events. He created a pumpkin walk for families with luminaries and Jack-o-lanterns and a haunted house for teens and adults. Last October, he brought spirits into the mansion cellars with the help of Limelight in Lee and stage and set-design students from Bard College at Simon’s Rock. The Halloween events have grown year by year. Last October, 7,000 people visited. And then Winterlights dazzled the landscape. Cruey and his staff worked for months to electrify the house and grounds, creating a rainbow of lights on the linden trees, gold on the birches by the Blue Steps, blue shimmering around the fountains, and a lit fir tree in the library. In six weekends, Naumkeag attracted twice as many people as it often sees in a summer, even in a raw early winter without snow. And these are not summer visitors, Cruey said. They are local families. He looks forward to welcoming many of them again in April. Cruey has designed the bulb plantings with paths to follow and color all through the garden, and he has channeled the new flood of flowers. Mabel Choate had not planted many bulbs, he said, because she most often came to the house in the summer. So in the past, her gardens have not bloomed widely in the spring, not even her well-known terrace of white and crimson tree peonies. He will open the festival when the flowers open. Spring in New England is rarely predictable, and warm days almost never begin on March 21. By mid-April the buds will be stirring, and the gardens will open, like Winterlights, with a trail to follow and surprises, art installations and decorations in each garden room. Each weekend Cruey will have activities on the grounds: a scavenger hunt, craft tables and games for kids, greenhouses open with bulbs on display. “And we’ll have flower sculptures,” he said, shapes made from blooms -- pansy balls and tulip trees. He is planning pop-up performances including a concert on the last weekend, May 12, for Mother’s Day. He wants to encourage people to wander the gardens and grounds informally, he said, and get familiar with them. Let their children run on the lawn where the Choates held amateur plays. “Bring your mother, or any caregiver you want to celebrate, and bring a picnic,” he said. Naumkeag has set up a cafe, working with the Marketplace in Sheffield and Harney teas, and now it also has begun working with Berkshire Mountain Distillers – with a concession cart that premiered at winter lights and will come back all summer. The house and grounds will open for the regular season on May 17, when tours of the historic property begin, and Naumkeag will join in a celebration of Trustees of Reservations properties across the state by opening free on May 18. Events will take place inside the house and out on that free day with an art-and-architecture theme, Cruey said. Starting in June, Naumkeag will stay open in the evenings, from 5 to 8 p.m. every day. People can bring a picnic, sit out on the grass, watch the sunset and sip a gin and tonic with lime, even before live music returns at the end of June with “Naumkeag at Night” weekend concerts. Taking in these gardens at quiet times is one of the hidden pleasures of the Berkshires, says Carrieanne Petrik, the Trustees of Reservations’ engagement manager for southern Berkshire County. The Choates used the landscape to create the sense of another place, she said, and she enjoys walking on a warm night through the grove of birches planted in the rocks. From the pagoda, she said, she can see some of the best sunsets in Berkshire County. Naumkeag will open for its Daffodil Festival on Thursdays to Sundays from April 25 to May 12, and it may open sooner if the spring and the flowers come earlier. Check naumkeag.thetrustees.org for day-to-day updates in April and May.